Fruiting body slender, cylindrical to slightly club-shaped, usually unbranched, 2-5 cm tall, 1.5-3 mm thick, straight to slightly curved in profile, sometimes flattened in cross-section; apex obtuse to spatulate, less commonly pointed, usually tapering toward the base; surface smooth, yellow-orange to orange, yellow below, typically pallid to white at the base; flesh pale-yellow, pliant, turning yellow-green to green in 10% KOH; odor and taste mild. Spores 5.5-6.5 x 4-5 µm, smooth, subglobose to pyriform, apiculate; spores white in deposit. Single, gregarious, or clustered, on soil, moss and duff in hardwood/conifer woods; fruiting from mid to late winter. Unknown, but too small to be of culinary value. 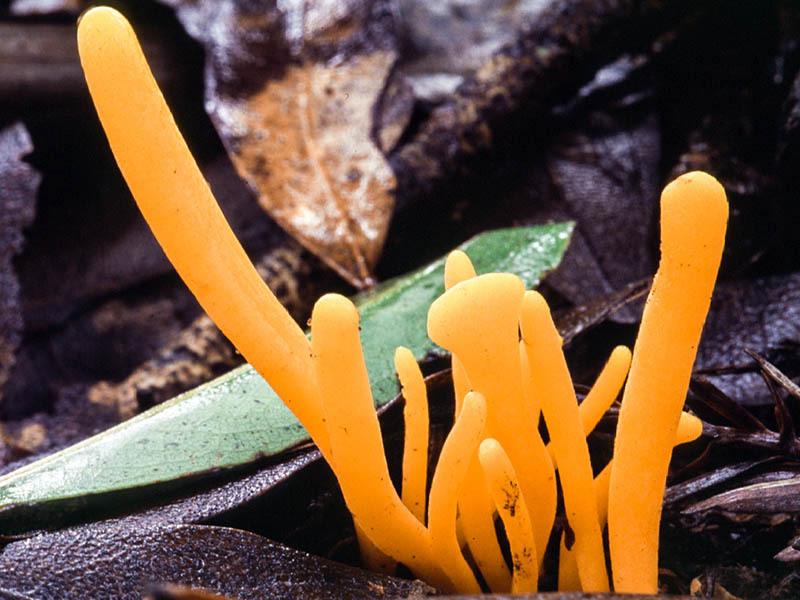 This diminutive, brightly colored coral is often confused with Clavulinopsis fusiformis, but the latter is typically yellow while C. laeticolor is usually some shade of orange. 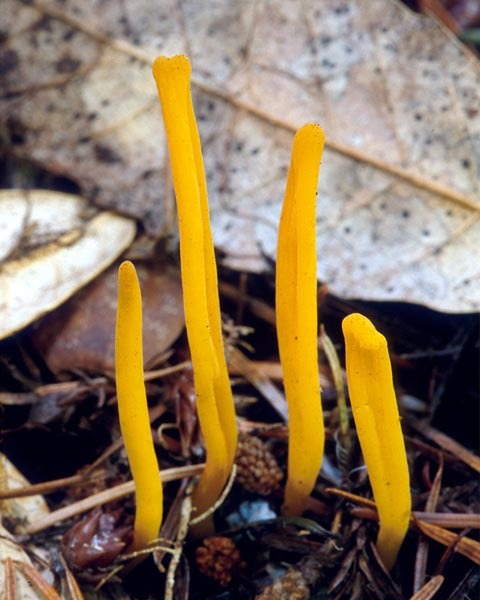 Both species can fruit in tufts, but clusters of Clavulinopsis fusiformis are more likely to be fused at the base. 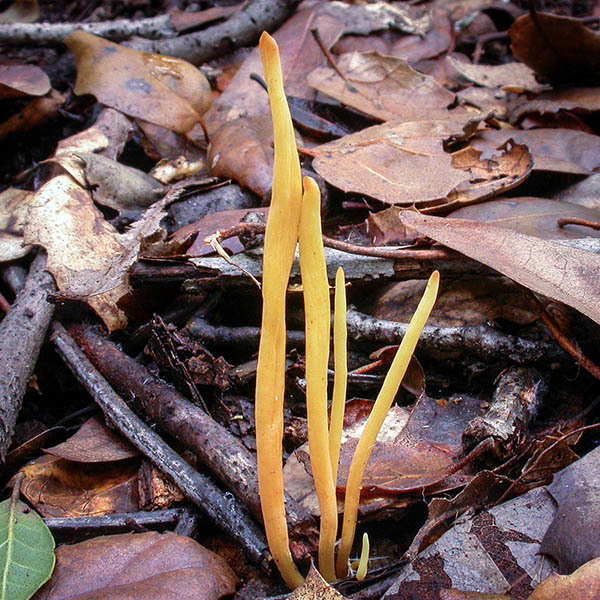 In addition, Clavulinopsis laeticolor is usually mild in taste, while C. fusiformis is typically bitter. The two species also react differently in KOH. According to Tylutki, a 10% KOH solution will turns the flesh of Clavulinopsis laeticolor yellowish-green to green, but has no effect on C. fusiformis. Finally, spore shape also differs, the spores of Clavulinopsis fusiformis spores are spherical, while those of C. laeticolor are subglobose to pyriforme. Breitenbach, J. & Kränzlin, F. (1986). Fungi of Switzerland. Volume 2: Non-Gilled Fungi. Verlag Mykologia: Luzern, Switzerland. 412 p.
Corner, E.J.H. (1950). A Monograph of Clavaria and Allied Genera. Oxford University Press: London, England. 740 p.
Desjardin, D.E., Wood, M.G. & Stevens, F.A. (2015). California Mushrooms: The Comprehensive Identification Guide. Timber Press: Portland, OR. 560 p.
Ellis, M.B. & Ellis, J.P. (1990). Fungi without Gills (Hymenomycetes and Gasteromycetes). Chapman and Hall: London, England. 329 p.
Petersen, R.H. (1968). 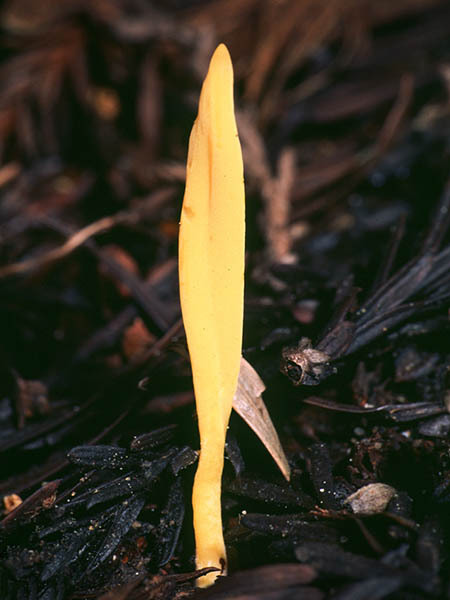 The Genus Clavulinopsis in North America. Hafner Publishing Co: New York, NY. 39 p.